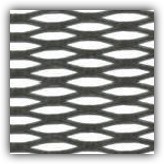 Expanded Metal and Woven Wire sheets are useful in a variety of applications including perforated screens, metal grilles and cages. We carry sheets in a variety of metals including Aluminum, Steel, Stainless Steel and custom alloys for specialty applications. Let Remaly Manufacturing be your supplier of custom sized expanded metal and woven wire sheets. Upon requesting information, please specify the desired material, thickness and sheet size. Orders are processed within a week. Aluminum, Steel, Stainless Steel, or other special alloys are available for both Expanded Metal and Woven Wire orders. For Expanded Metal sheets, we can work with 1/4" - #20 and 3/4"- #9 style designations. We can create both Expanded Metal sheets and Woven Wire products in all shapes and sizes. We sell woven wire and expanded metal sheet format only. There is no minimum order size for expanded metal and woven wire sheets. We sell single sheets and large quantities. Perforating Presses, CNC Punches, Brakes, Bolt Hole Punches, Parts Leveler, Roll Formers, MIG, TIG, STICK Welding Equipment, Shears.